Jose Luis Rodriguez captured the imaginations of the judges with a picture that he had planned for years, and even sketched out on a piece of paper. With a great deal of patience and careful observation of the wolves’ movements, he succeeded in taking the award-winning photograph. 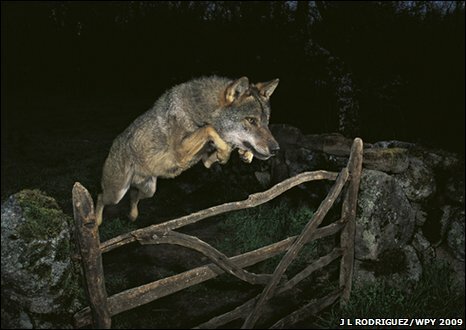 Mr Rodriguez used a custom-built infrared trap to snap the wolf as it leapt into the air. This subspecies of the grey wolf lives close to human habitation in northern Spain.